A quick summary of the plot of issue #16, written by Joshua Williamson and illustrated by Carmine Di Giandomenico (colors by Ivan Plascencia). Barry knows he’s been outfoxed…and he arrives back in Central City just a bit too late. The Rogues have split up, making their biggest heists yet…possibly their last? That’s how it looks, as each Rogue has made the kind of robbery that could set one up for life. As the Flash talks to Iris, he is willing to take the heat…but Iris gives him an idea that allows him to catch up to Heat Wave! Heat Wave gets the upper hand, and it looks like Barry has been roasted. But, as Mick gets back to the rest of the Rogues, Len Snart knows better…Flash has allowed Heat Wave to appear to get the upper hand so that he can track him back to the whole group of Rogues! Barry now appears to have the upper hand, taking care of most of the Rogues…until Captain Cold reveals his target during that raid on Central City. Snart robbed S.T.A.R. Labs of some parts related to the Black Hole group, and he’s created a new weapon that may finally stop the Flash…cold! Joshua Williamson’s arc gives us the Rogues at their best. We have a team of blue-collar bad guys who have been able to show enough strategy and discipline to actually throw the Flash off his game. Yes, Mick made a critical error that led Barry straight to the group…but in this case Len Snart was planning even further ahead…and as we hit the cliffhanger things look very bad for the Fastest Man Alive. My only concern relates to something beyond he creators’ control…the shortening of DC comics to 19 pages. It’s a result of the REBIRTH era decisions on publication…keep prices low, publish some titles twice per month, and keep individual issues down from 22 pages to 19. It causes some issues of several titles to appear a bit rushed as creative teams deal with those three fewer pages. It may seem a bit of an odd use of terms to complain about a FLASH title seeming “rushed”, but the story seemed to move at a slightly rushed pace to keep everything down to 19 pages. It is great to see Mick Rory with a look that leans a little closer to his classic depiction. This appears to be a combination of the classic look and the New 52 version, in a way that really worked for me. The main cover was a bit confusing, as it refers more to last issue’s Mirror Master-centric story. (NOTE: I downloaded my copy of THE FLASH on comiXology, so your version may vary). That being said, I really liked the alternate cover, with the Flash running past some hummingbirds. It seemed like a bit of a nod to the Jim’s Big Ego song, “The Ballad of Barry Allen”. Bonus fact: the lead singer of Jim’s Big Ego is Jim Infantino, the nephew of famed Flash artist Carmine Infantino. Other than that, I’m a big fan of the Rogues and have been for five decades…and seeing them able to fight the Fastest Man Alive to at least a draw makes this a very exciting arc. RATING: I’ll give this one an 8/10. A good story, a great portrayal of the Rogues (although I’m still missing one particular member of the group), and only a minor complaint related to the 19 page format of DC books right now. That’s my take – what do YOU think? Please leave your comments below! You are correct about the covers. All the covers for the current Rogues arc have been odd. The first one featured Captain Cold with the tag of “The Return of Captain Cold” even though Cold didn’t really appear in the issues. 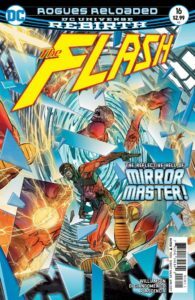 Issue 15 featured Heatwave even though Flash battled Mirror Master and this one had a Mirror Master cover. I wonder if these were drawn a head of time, but placed out of order for some reason by editorial.